From birth to age 2, babies spend more of their time asleep than awake. A sleeping baby can provide relief and a little rest break for new parents! Though it looks like babies aren’t doing much while sleeping (besides looking adorable), sleep is vital to their physical and mental development. Two main kinds of sleep are rapid eye movement (REM) sleep and non-rapid eye movement (NREM) sleep. During REM sleep, the brain experiences rapid eye movement, hence its name. The brain is busy during REM sleep (and it’s also when we as adults dream.) During NREM sleep, or non-rapid eye movement sleep, the body’s immune system gets a boost: blood flow increases, tissue growth and repair occurs, and energy is restored. 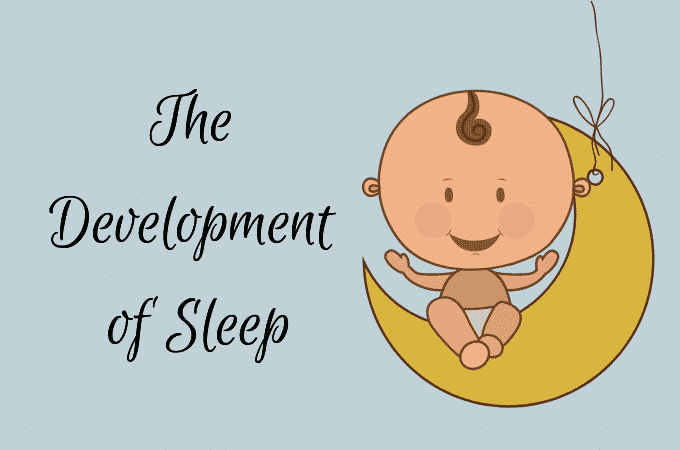 In both phases, sleep allows a baby’s brain to form neuronal connections, helping baby process and learn the information they absorbed when they were awake. A fatty substance called myelin forms around nerve fibers, increasing the speed at which information travels from one nerve cell to another. This brain activity that occurs during sleep helps develop functions like language and attention, and it can influence mood and developmental disorders. It can even affect a child’s healthy weight later in life. Newborns up to 3 months typically need 14 to 18 hours of sleep. Their internal clock hasn’t developed yet, so they tend to sleep on and off throughout the day. Infants over 3 months sleep 9 to 12 hours per day, not including naps. Since babies are sleeping most of the time at this age, and their sleep cycles are only 50 minutes long, they are experiencing more REM sleep than adults. Their brains are developing and enhancing different cognitive and physical skills. Since their sleep cycles are shorter, this also means they spend more time in light sleep and awake more often than adults. At this age, baby’s sleep cycles are transitioning to a schedule more similar to an adult’s. They’ll need about 12 to 15 hours of sleep. Their longest period of sleep is at night and they may wake less throughout this sleep. Your baby will usually wake up briefly following the end of a sleep cycle. Some babies may need help settling back to sleep and others may fall back asleep on their own. Children at this age need less sleep than before, about 11 to 14 hours of sleep. Most toddlers at this age still take daytime naps that last an hour or two. Toddlers have more developed motor and cognitive skills at this age: they can get out of bed on their own, they may have separation anxiety, and they have an increased need for independence. These factors can cause problems with sleep. The first 3 years of a baby’s life are especially important in the development of sleep habits and vital skills. Healthy sleep is essential for the rapid brain development that occurs during this time. If you’re unsure of how to best handle your baby’s developing sleep cycles and habits, a sleep training expert or newborn care specialist can help. Baby Not Sleeping Through the Night? between 6 and 7 p.m.
between 7 - 8 p.m.